What matters to your clients? Building the online reputation you’ve always wanted for your business. If you’re just starting out and/or have very few and not that impressive reviews, you need a strategy to promote positive content, improve ratings and protect your business from the negative people out there. For this strategy to work, it has to be congruent with your industry: how and where do prospects look for businesses like yours, what matters most to them and what are you doing to ensure they perceive your brand as a brand they can trust? If things are not going as well as you’d hoped, there is a way to remove and suppress harmful comments and we know it. Our team of experienced reputation management specialists have both the customer service and the technical skills to help you improve brand sentiment and get your business associated with positive experiences. 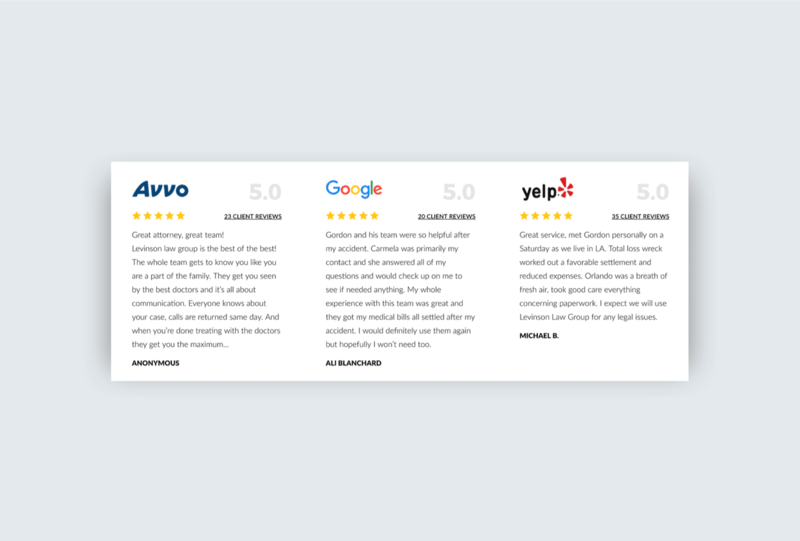 We manage your reviews and improve them one at a time. Say you did well in encouraging clients to leave you reviews, but poorly in getting the reviews you really wanted. Now you have all these comments to respond to and you’re not even sure what is the right way to do it. 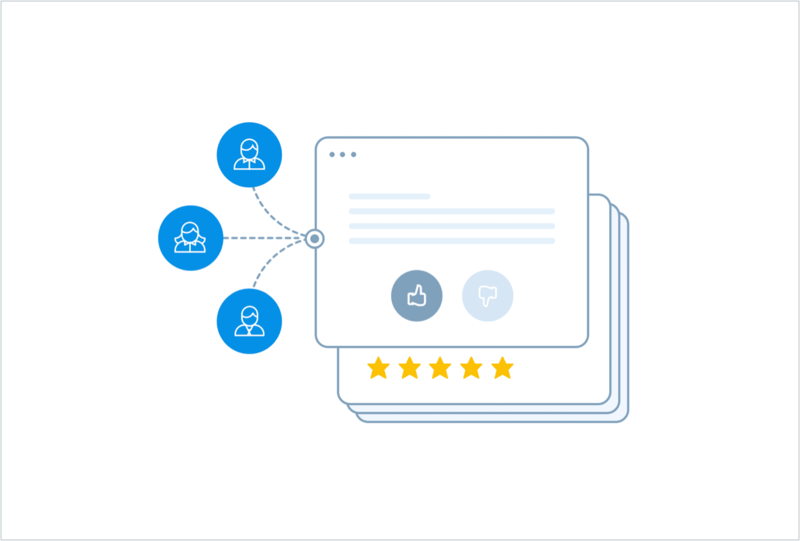 Proactive review management means instantly intercepting reviews, both good and bad ones, and immediately taking action. 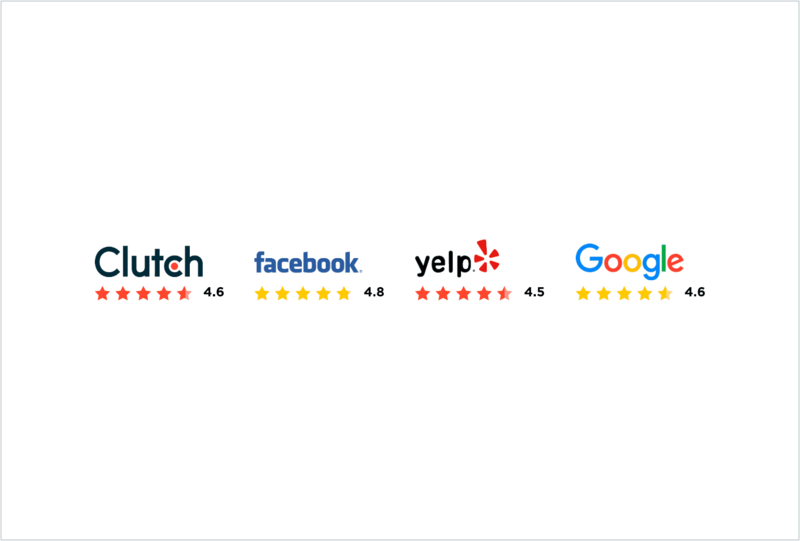 Your overall approach to each and every review ultimately determines your average star rating on most online platforms, which is what most prospects look at. Kruger, Inc. is a Canadian-based family-owned company who specialize in the production and distribution of renewable and sustainable products across various sectors and industries. 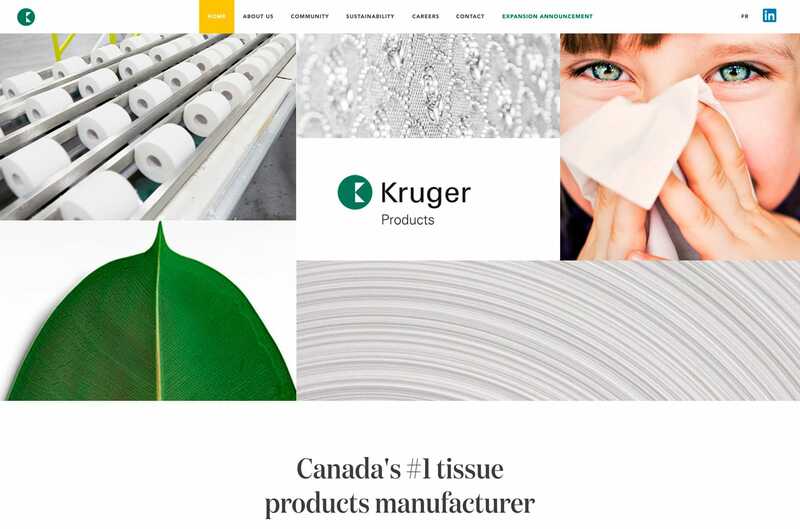 Kruger, Inc. is also the #1 produce of tissue products in Canada. Kruger were in need of a world-class website to help convey their story and the culture of the company: working within different industries and communities through sustainability efforts and renewable resources. CWA developed a modern and easy-to-navigate corporate website for Kruger, allowing them to properly provide information about the company as well as insights into the work they do and the sustainability-driven goals and culture that they adhere to. Additionally, we created a user-friendly mobile version of the site for an optimal on-the-go experience. AARP is a US-based non-profit interest group whose purpose is to help empower the aging American population by means of advocating for social change through information, advocacy, service, and lobbying activities. 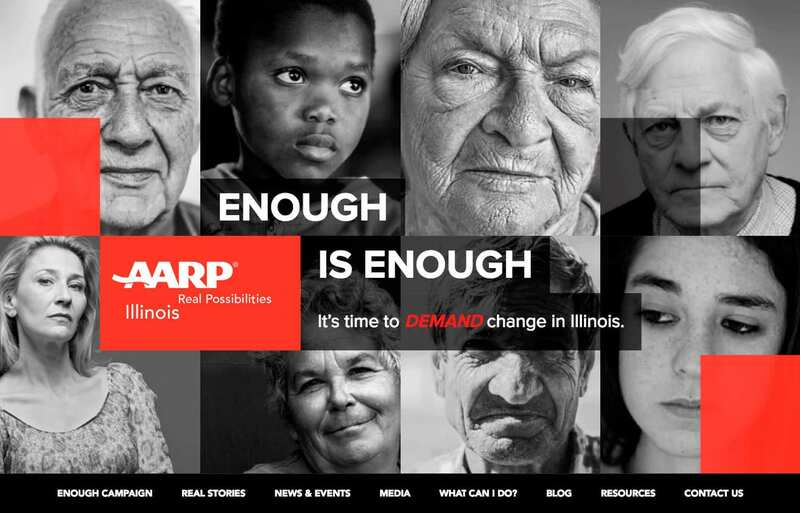 AARP Illinois tasked Comrade in designing a website that would help them drive IL residents to engage elected representatives as means of holding them accountable for drafting a sensible state budget. With this, CWA would help AARP develop what would become known as the “Enough Is Enough” campaign. The goal was to create tools to enable residents to add their own stories and opinions on the crucial topic of state budgeting and its adverse effects on the elderly population. CWA created an easy-to-use website that lets users find appropriate information and get involved. Users can subscribe to a newsletter, browse through and submit stories, discover facts and statistics regarding the state of IL, and stay up-to-date on current news regarding the budgeting crisis. Finally, the website guides the user toward action and engagement, including sharing content through social media. 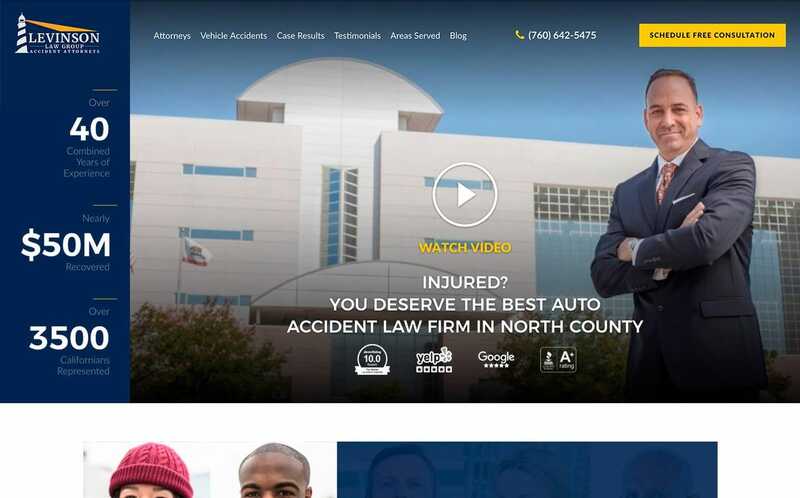 Levinson Law Group is a Southern California-based firm specializing in personal injury cases that vary from client-to-client, with a particular scope of work focused on vehicular accidents. Their old site failed to position the firm as leaders within their industry. Important information was not properly communicated, their story was not properly told, and the content was not up-to-date. Additionally, they were relying heavily on paid ads to help them generate leads while failing to implement a proper SEO strategy to achieve sustained growth. The first step was to completely rebuild the site, clearly communicating the firms impressive track record and story. CWA added a video to reinforce the firm’s message and reputation. This was coupled with a streamlined layout for easy navigation and implementation of new content, all structured as sales funnel to help display information and generate leads. The next step was to optimize onsite SEO as well as strategize offsite activities to help strengthen the firm’s local presence in Southern CA. This new approach allowed the firm to grow their audience beyond their local markets and help garner them a reputation throughout Southern California. Through effective paid advertising strategies, CWA has successfully helped Levinson Law Group decrease the amount spent on ads while increasing the amount of viable leads generated from these campaigns. Belgravia Group is a premier real estate company from Chicago, with a legacy spanning over 70 years and having developed well over 2,000 properties within that time. Belgravia consulted with CWA on creating a modern, attractive website to properly showcase the company’s culture and history. After multiple creative brainstorming sessions, CWA was able to develop the blueprint for what would become a stunning site to help represent Belgravia. 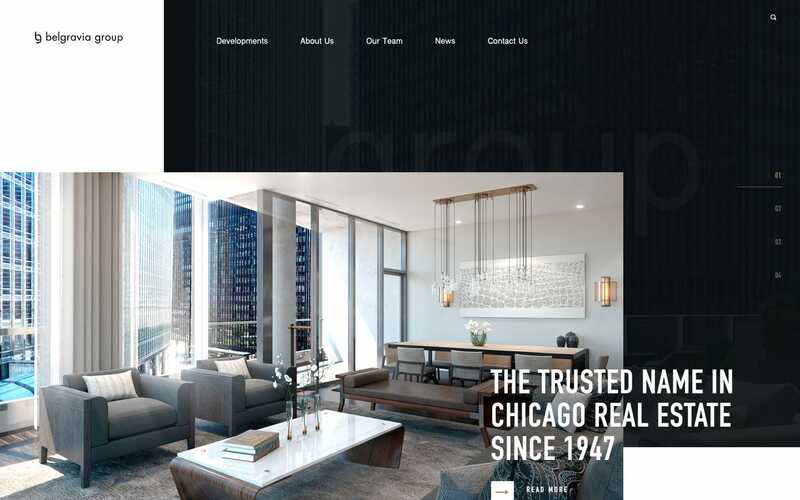 Belgravia’s prior website was stagnant and required a revamp that would give them a cutting-edge and modernized look to match their niche of real estate: high-end properties in some of the most popular neighborhoods of Chicago. The approach applied was both minimalist and interactive: the website has a clean-cut layout with easy navigation. CWA also consulted Belgravia in creating unique, professional content to add to the site, helping to strengthen the company’s online reputation. The visual content consists of beautiful professional photography that showcases the properties Belgravia Group manage. Blueprint is a Chicago-based advisory firm that specializes in senior housing and healthcare real estate, offering unique exit strategies, solutions, and consulting for both investors and operators. 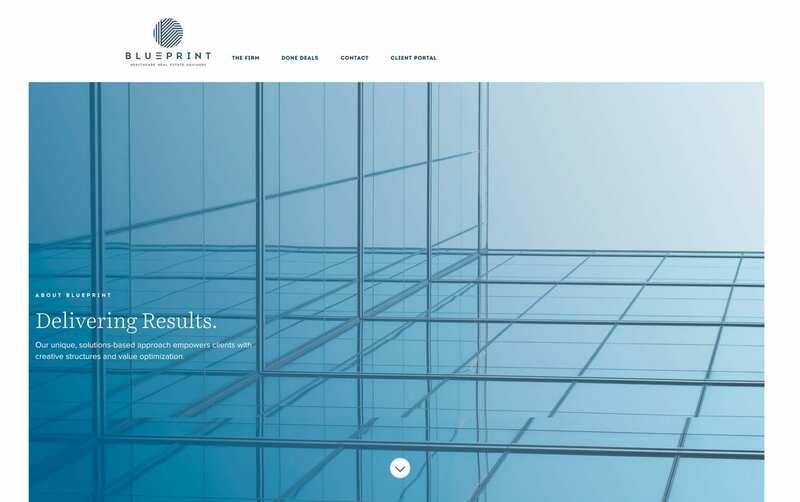 Blueprint enlisted Comrade Web Agency to revamp their website, create a client portal for investors and operators, and to develop a mobile app for their services. Vesta Preferred is a Chicago-based real estate company specializing in luxury properties in some of Chicago’s most sought-after and vibrant neighborhoods. After consulting with Comrade, a strategy was set in motion to help expand Vesta’s digital footprint through a revamped web presence and lead generating campaigns. 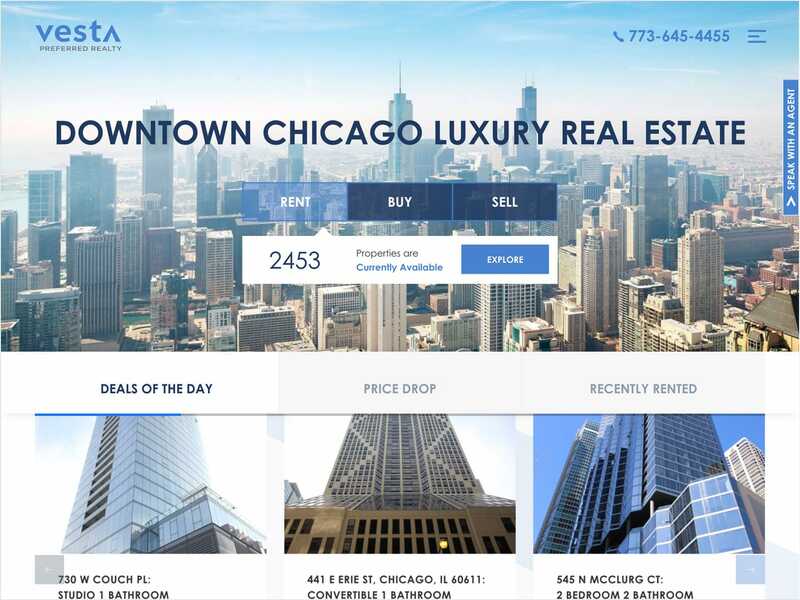 Vesta required a website that would serve as a platform for visitors and potential customers to rent apartments, buy homes, or sell properties, all through an easy-to-navigate process with efficient filter functions for an optimal experience.Vesta desired to become a thought-leader within their industry, looking to help anyone seeking a new home. Their new website and branding needed to accomplish this. CWA rebranded Vesta Preferred, developing a modernized website with a reliable search feature. The easy-to-use website allows users to browse through properties in real-time, including viewing inventory, property details, draw comparisons, and schedule an appointment if need be. 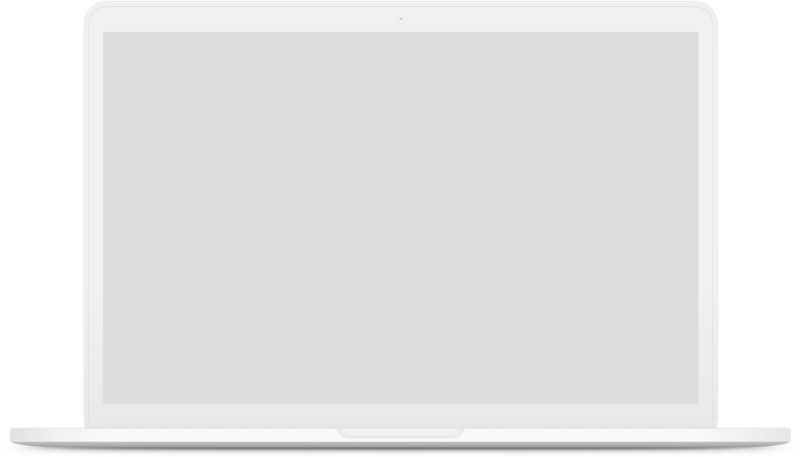 Additionally, CWA placed various lead magnets to increase user interaction. A very robust admin portal was custom developed for Vesta’s team to help manage and control all aspects of their site and it’s listings. A special attention was given to a mobile experience recognizing that 70%+ of Vesta visitors are viewing the website from their mobile devices. 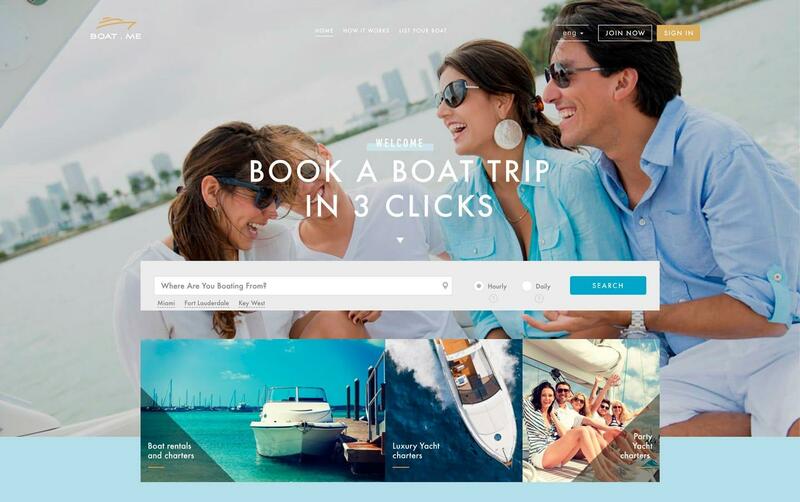 Florida-based company Boat.me offers a unique platform where boat owners can sign up to offer their boats (with or without captain) on an hourly or daily basis for leisurely use. Owners may host or simply rent out their boats for trips. Alternatively, if a renter is interested in borrowing a boat, they can enter their preferences and location and be matched with boats in their area. Boat.Me required a website that would allow them easy access to their boating “inventory” in real time. Owners had a need for an area on the website where they could make updates on their boats such as availability. This was asked to be housed in an attractive, fun looking website that was easy-to-use. CWA created a sleek, interactive website that help Boat.me run their business efficiently. A website included an easy-to-use interface for members, one-time renters, and boat owners. The company’s platform offers an easy, streamlined experience for all users. Outsourcing your marketing is a huge decision, because marketing is what you do to present your business to the world. How will you ensure this presentation looks, sounds and works the way you’d like it to? We take the time to get to know you and what’s unique about your business, then use it to your advantage. Some marketing agencies are great at making promises. We’re great at getting you more clients, higher profits and faster growth. We’ve spent the last 10 years perfecting our processes and learning all we can about digital marketing. Now is the time to take advantage of our expertise. We’re devoted not only to your business’ success, but also to making you feel calm and confident about your marketing investment every step of the way. Comrade did an amazing job helping establish our brand. Building an online presence, growing it’s digital brand and giving our customers a unique customer experience. Highly recommend Comrade’s team.